This is infact a truth on various blogger communities. do u ?? hehehe !! 😀 yes part and parcel of the blogging game !! lol !! confession is difficult to begin with !! Hahahahahahahaha! Loved this post! Let me be frank, I still don’t visit many blogs I vote for. But, sometimes I try my best to read and comment on the posts I vote depending on my mood, time, patience and interest. I know voting blindly is bad thing but I love the attention it gives me. For me it is right kind of wrong!! I love what you said here, not many will speak the truth. When I was new like you, I had similar feelings but eventually you learn. As someone said, truth about all blogging communities. LOL on you writing on bananas and they complimenting on monkeys. I have written so many post on honesty in blogging without much effect. Well, it does and there are many blogs who are a living proof of that. You can only survive and flourish with honesty and quality. Ha ha ha. That’s true statement. What most of us do here is: let me scratch your back and you do mine. and thats how the world is moving on …. 🙂 Sir, It is amazing that still right people are flooded with followers and comments .. I wish even I could impress with my work… my day starts and ends with voting to get few people dragged to my site … 😀 😀 .. thank u for sharing your thoughts sir !!! Come off it, MySay, you cannot eat your cake and have it too. It is like playing cricket and hating runs. My dear MySay, if that is the case, you could be doing a disservice to the medium. You must call a spade a spade. That is the least I expect of a genuine humourist like you. well….I do my bit of justice .. I leave a mark of the precious time I spared on reading anyone and its justified ..even if its a bad read… !! I did spend my time which is indeed precious be it anyone . Ain’t it ? Well, I am not the only judge , I feel so… by appreciating whom everyone else is I make myself believe there are so many things I like (like my own posts) others don’t 😀 .. so what ? its the ones who did not understand my humour .. not that I am making no sense !! Likewise, with others .. may be its no sense for me … but i vote coz i had given my time reading it and also coz may be I am the fool who thinks the post is utter rubbish but so many people altogether may not be wrong !!! 😀 … well, looks like ,u will take my for a ride for confessing and letting few fellow bloggers confess the facts!! Hehehe… But honestly, you are the only one when types a comment too, i read it twice and thrice to make sure , I get all the meanings hidden behind a single sentence . Its my pleasure , I know u and get to read you and so much I learn everytime we interact !! That’s a fact which every one would nod their head to! P.S. Beware of the black Sheep ! it might like your post for the sake of a reciprocal 😉 ! U are being harsh on yourself bro ! ur work is commendable and who doesn’t understand it, its not your fault ! So keep it rolling ! you have readers like me in your list ! indeed … i am blessed with few but really appreciable readers 🙂 Aziz,thanks for giving the license to kill with my doodles 😀 appreciate it bro!! Can a bloggers’ community be any different from other human communities? hehehe ….. my monkey is in me .. hehe …u will get to see many monkeys soon now that ur in the blogging arena .. I welcome u in :).. thanks for dropping by ! Appreciate it !! A standing ovation for the truth you have exposed. I started with same thing because my fellow famous bloggers advised me . But shortcuts and cheating wont work any time and anywhere . One can gain short term gains but not full term prosperity . One has to work hard . If he does not want to comment better don’t comment. but atleast be honest. Also thanks a lot for your support with splendid encouraging comments on my blog.Dear Friend I am unable to find your name or personal email id searching your blog. Are you keeping it secret ?? hehehe nahi bhai .. my email id is mentioned in the About Page : mysay@india.com /mysayindia@yahoo.com and maa baap nei pyar se naam Nitesh rakha tha .. is zalim duniya nei Jack banadiya … badi lambi kahani hai… kabhi fursat se sunaoonga 😀 😀 I thank u for all ur continued appreciations which enables me to work harder !! Its true there is no short cut .. what u give u get back.. if i vote and dont check what ur post was all about … sooner than later u will also start doing so … and thats how it happens… commenting is only possible when a person checks the post and the only prove of authentic reader. thanks BiYaGo.. I had your comments in spam .. Sorry for delayed response.. thanx for dropping by and leaving your valuable comment !! technical ?? they might be termed mental articles 😀 thanks for dropping by ! 🙂 Taking a cue from Debajyoti? well inspired like Anu Malik does !! or Pritham ! !! hehehe.. but this is my first and last take on the blogging arena i guess… 😀 i recieved more criticisms than appreciations !! hahahaha thanks for dropping by !! hehe Honesty is alas a quality that is not really visible. I think the voting feature must be done away with. And there are times when I can make out from the comment that the commenter has not read the post at all :). I have since long stopped caring about votes. Bliss! Haha, nice and true to a great extent! I feel that voting can also be seen as a way of showing you appreciate. Not always do we have the time to read and comment on every blog we may be voting for, it is almost impossible. But we may have read it in the past, sometime and we like what they say, so we go ahead and give them our vote. As someone very rightly said above, it is the truth about all human communities. You too seem to be following Debojyoti’s route. Well, to be very honest I can’t read crap (with due respect and apology to all bloggers) even if I try hard nor can I vote for them. That has landed me in trouble coz I don’t get much votes in return nor comments for that matter on my posts. So, I guess I should be contented with what I get as it is directly proportionate to what I give. But there are a few blogs which I follow on a regular basis and y’ know which ones. Also there are a few, which I would like to, but due to time constraint I can’t. Sorry to all those nice bloggers, some of whom have commented on this post too, and vote ( I suppose they read it as well) in favour of my posts too. However, in return, I fail to do justice to their enthue and consistency. Indebted to their kindness, least that I could say. i loled at the cartoon…imagined…read words and finally agree to all u’ve just said. Initially when i blogged it saddened me to see an empty comment box. Hubby dear told me gently one day (although even he shirks my blogs), ” Darling there’s not much to say on ur words…you leave everyone speechless…” Now i’ve given up on that idea of renaming my blog as Nishabd. i am content with the few who vote even without reading as Valli says, i am also content with the fact that someone out there has noticed. And when a couple of comments arrive…hurrah! my day, evening, night is made. yes it is but then as I believe nothing is perfect unless we are .. I have decided to be perfect .. read the post express my views and then vote !! I loved your posts..Really Humorous!!!! hei thanks for dropping by and sharing your approach on voting on indiblogger… I am grateful to indiblogger for a reason that we the bloggers, scattered all over , can have a place to share our work amongst ourselves . Though other blogging communities are there but Indiblogger is much more professional and they give bloggers the right to select. Aren’t black sheep the rarer kind? 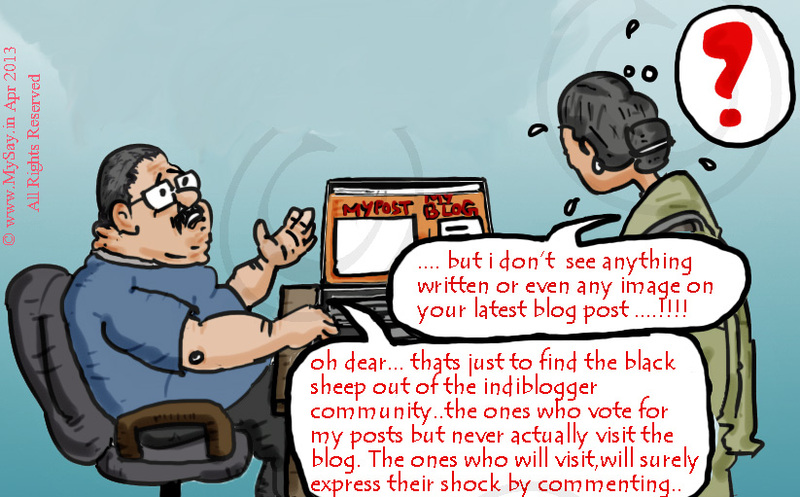 Me thinks the real black sheep then are the real readers, because they are rare on indiblogger! good one! well thanks for dropping by and appreciating Chaitanya !! The truth has been presented in such a humorous manner. It is true that one writes about bananas and gets compliment about monkey! This happened one on my blogpost. And the Doodle is great, blank post, good way to find the truth! 🙂 Keep it up!